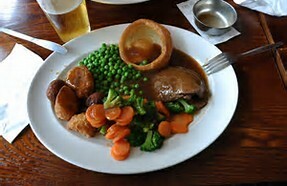 I have a son-in-law that likes nothing better than Branston pickle with his Sunday roast dinner. I object, but somehow it always gets to the table. However, I would definitely draw the line at tomato ketchup. It just does not belong with a roast! Yet it seems I am being a kill joy, as according to supermarket giant, Asda, the traditional Sunday roast is being dumbed down with the addition of tomato ketchup, sausages and baked beans. 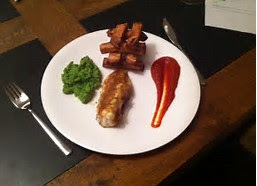 Researchers for the high street store are reporting that the once classic Sunday dish is now almost unrecognisable, with one in five adult admitting to dousing their roast dinner in tomato ketchup, while other unconventional additions include mushy peas, baked beans and pickled onions. No mention of Branston pickle though! I'm a food purist - a 'reaI' foodie and I must admit and I am horrified to learn that our traditional gravy accompaniment is being replaced by ketchup. In addition, it seems that parsnips are giving way to chips too, while roast meat, always the Sunday roast centre-piece is being dumped in favour of sausages. O dear, what is happening to British food values and culture?